Consulting rooms available for rent in the City of London. The city of London therapy room is in the heart of the financial district. Located in the Bishopsgate area, set within a peaceful courtyard along Liverpool Street, opposite the mainline station. The room is also a two-minute walk from Liverpool Street underground. The room for hire is fully furnished and benefits by having access to a reception and waiting area. It is also equipped with wifi. Clients can access the room by using the lift or the stairs. Bathroom and kitchen facilities are available on the same floor as the therapy room. 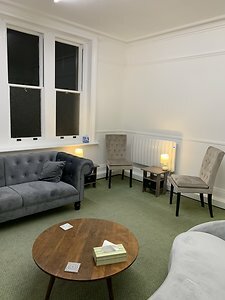 The room in Liverpool Street is appropriate for health professionals who practice clinical psychology, counselling psychology, psychotherapy, counselling, coaching, hypnotherapy, and other similarly qualified practitioners. Must be able to evidence both qualification and insurance. No ad hoc. The Bishopsgate area is essential if you wish to alert prospective clients of your practice - the room is in easy access to the surrounding areas such as Shoreditch, Whitechapel, Spitalfields, Brick Lane Market and Cannon Street. Availablilty and prices - April 2019. 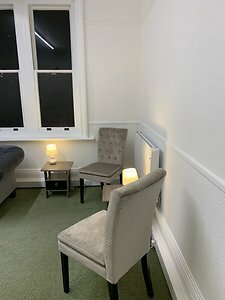 Counselling and psychotherapy room rental also available in London Road, Tunbridge Wells. London Road: Ideal for counselling, psychotherapy, family therapy, hypnotherapy, NLP, and life coaching. Special offers in Tunbridge Wells.